Psoriasis is a common, chronic, inflammatory, multisystem disease with predominantly skin and joint manifestations affecting approximately 2% of the population. In this second of 5 sections of the guidelines of care for psoriasis, we give an overview of psoriatic arthritis including its cardinal clinical features, pathogenesis, prognosis, classification, assessment tools used to evaluate psoriatic arthritis, and the approach to treatment. 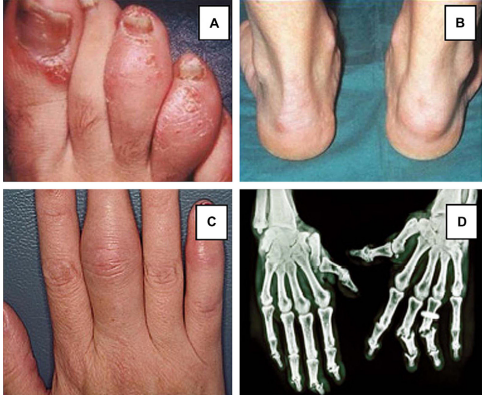 Although patients with mild to moderate psoriatic arthritis may be treated with nonsteroidal anti-inflammatory drugs and/or intra-articular steroid injections, the use of disease-modifying antirheumatic drugs, particularly methotrexate, along with the biologic agents, are considered the standard of care in patients with more significant psoriatic arthritis. We will discuss the use of disease-modifying antirheumatic drugs and the biologic therapies in the treatment of patients with moderate to severe psoriatic arthritis.